As many of you will know, a conference was held at the University of Toronto at the beginning of October in honour of Frye’s centenary, and on Thursday evening a bronze statue of Frye (modeled on the one originally unveiled in Moncton earlier this year) was unveiled in the quad of Victoria College. 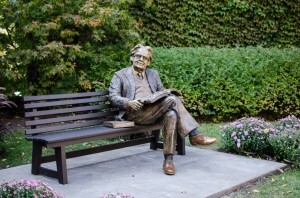 The statue is located just outside Northrop Frye Hall. For more on the unveiling, go here. This entry was posted in Uncategorized on October 19, 2012 by Joseph Adamson.